Hello All! I hope you had a great weekend! Our release party on Friday was a perfect start to a great weekend! 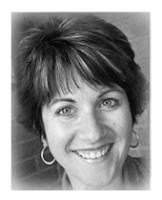 Today I get to shine our little Verve spotlight on Guest Diva Christina Fischer. I've been a fan of Christina's fabulous style for quite a while, and even though I knew how awesome she was, she still blew me away with her projects for this release. I'm inserting a few of her projects throughout her VERVE-i-view below and you'll see what I mean! To see all of her projects for this release, you can view her guest album in our gallery. 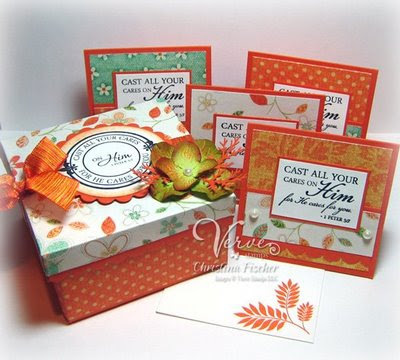 Okay I'll start things off with this adorable 3 x 3 card set box using the new 1 Peter 5:7 set and the Leaves plain jane. When/how did you get hooked on stamping? I became hooked on stamping after attending a friend's Stampin' Up! workshop about 8 years ago. Soon after that, I was introduced to Splitcoaststampers, and I haven't looked back since! 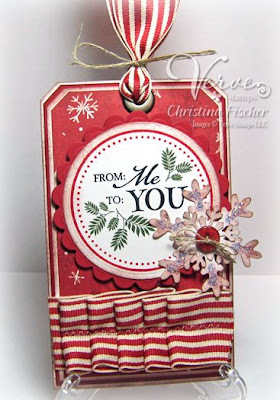 This tag Christina made with the Just for You set has me totally in the mood to start some Christmas designs. The fabulous ribbon looks just like that amazing old-fashioned peppermint candy. Gorgeous! How long does it take you to create a project that you're happy with? I am a sloooooow stamper. I fuss and fuss with layouts and details until everything sits right with me. Most of my cards take at least an hour to make -- but I've been known to work on a card all day until I was satisfied! Tell me about your creative space. When I'm working on a project, I tend to keep grabbing things as I go. When the frenzy is over, I'm usually left with quite a mess! I do have to pick it up and start with a clean slate before I can work on the next project -- I focus better that way! If you were stranded on a deserted island, what craft tool would you take with you? Why? I'd probably take my paper piercer. I use it all the time -- for piercing, faux stitching, brad placement, unclogging glue bottles... Besides, it might come in handy for catching some food! 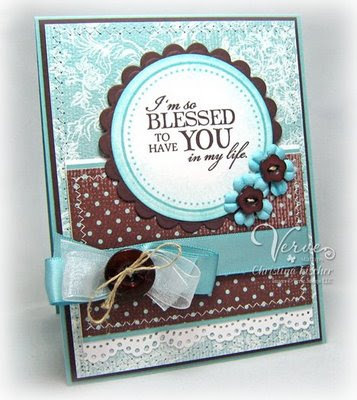 Okay, time for another intermission... and a totally Verve-a-licious card using Just for You. What is your biggest source of inspiration? Definitely Splitcoaststampers. I would never have tried new things or stretched myself creatively if I hadn't been inspired by the galleries and challenges on SCS. All the blogs I visit daily are a close second! Who in the stamping world do you want to be when you grow up and why? Oh my gosh -- that's too difficult to answer! I have to pinch myself all the time, because I get to work with some of the best papercrafters in the business. I truly feel humbled (and a bit surprised!) when I get the opportunity to serve on a design team or be a guest designer. I just hope to keep learning and improving! What is your favorite set from this release? That's a tough one! I would probably have to choose Forever in Our Hearts. Sympathy cards are often difficult to make, but the beautiful sentiments and images in that set make it much easier! So, you see what I mean? Fabulous designs and a thoughtful and fresh take on colors and embellishments -- every one of Christina's creations just captures your eye. I hope you've enjoyed learning a little more about this fabulous stamper as much as I have! Thanks for stopping by!